The clocks might be going back tonight to mark the end of British Summertime, but the City of York has gone back even further in time to link up with its historic ancestor, the Viking city of Jorvik. Twinning pairs of cities around the world is a common concept these days, but York has taken the concept of sharing cultures further, taking part in the world’s first ‘temporal twinning’, with its Norse predecessor. Interest in the Vikings has brought millions of visitors to the city, attracted not only by the re-creation of a 10th-century cityscape at Jorvik Viking Centre, but also by the Norse antiquities on display in museums and attractions. The names and layouts of the streets in the city centre even have Norse roots. ‘Coppergate’ derives from the Old Norse meaning ‘Street of the Cup Maker’ and street layouts in the city centre follow Viking property boundaries that date back 1,000 years, when Jorvik was a thriving metropolis and hub of international trade. Sarah Maltby, director of attractions for the York Archaeological Trust, said: “It seems strange to think how comparatively little residents and visitors knew of Viking-age York just 40-50 years ago. The Coppergate dig, from which the world-class discoveries revealed so much about day-to-day life in a Viking city thanks to detailed research lasting over 30 years by our own archaeologists, led to the establishment of Jorvik Viking Centre, which has welcomed more than 17 million visitors since it opened in 1984. 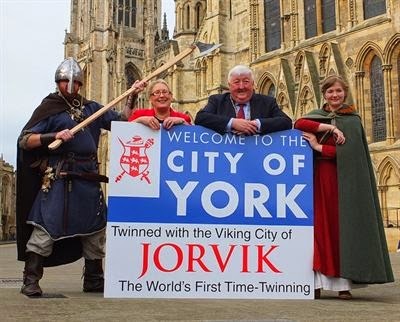 The twinning will be marked by the installation of a new series of ‘Welcome to York – twinned with the Viking City of Jorvik’ signs on major roads into the city, alongside new Viking-themed educational and outreach programmes co-ordinated by the Jorvik Group of Attractions. Next year’s Jorvik Viking Festival takes place from 14 – 22 February 2015 and is the largest celebration of Viking culture in the UK, regularly welcoming upwards of 40,000 visitors to the city. For more details, please visit www.jorvik-viking-festival.co.uk.